U.S. 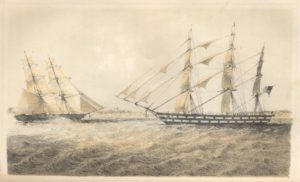 Naval Brig “Perry” Approaching Slaver “Martha,” from “Africa and the American Flag” by Andrew H. Foote (1854). Research the trans-Atlantic slave trade with the Trans-Atlantic Slave Trade Database, the latest featured resource at the PSU Library. This open access database is available for researchers across the globe, and also provides tools to examine the realities of one of the largest forced movements of peoples in world history. It contains multiple searchable resources, with detailed information on almost 36,000 slaving voyages between Africa and North America, the Caribbean, and Brazil. Timelines, chronologies and maps provide context into the transatlantic slave trade. Researchers can visualize the impact of the global slave trade over a long period of time, and also hone into detailed information about a specific place or time. Furthermore, a separate database sheds light on the voyages undertaken for the slave trade. Examine the captains and crews who sailed on slave ships, as well as the nations, and numbers of people transported across the globe. Finally, the African Names Database has information about 91,491 Africans taken from captured slave ships or from African trading sites. It lists the African name, age, gender, origin, country, and also the places of embarkation and disembarkation. This information gives researchers insight into many of the victims of the trans-Atlantic slave trade. The PSU Library has many resources that discuss the transatlantic slave trade. Research the history and context of the slave trade in the United States and globally with data and primary resources. Slavery in America and the World: History, Culture & Law is an open access database. It contains legal documentation on the historic practices of slavery in the United States, as well as the rest of the English-speaking world. It includes pamphlets, books, legal statutes, and articles on slavery. Slavery, Abolition and Social Justice is a database open to PSU faculty, staff, students, and researchers in the PSU Library. Primary source documents about slavery and abolition from Africa, the Caribbean, the U.S., Latin America, as well as Europe, span from 1490 to 2007.